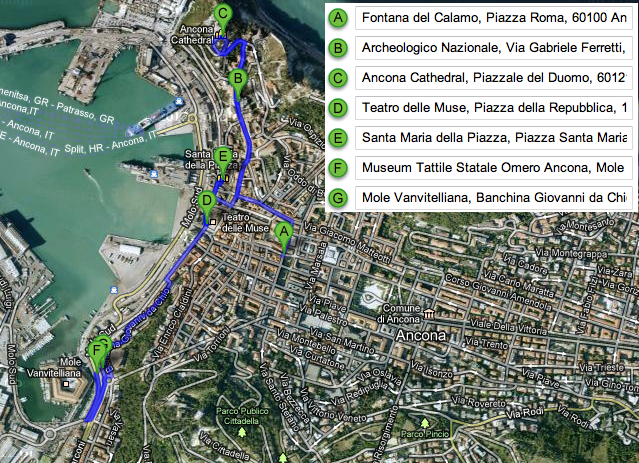 Below is how I would spend a day in Ancona. Click on the Google Maps link under the map below and add your hostel/hotel as the final destination to help you orient yourself. This information is correct at the time of writing (February 2013). If you have a suggestion on what else to do, a place to stay or somewhere nice to eat, please leave a comment! This entry was posted in Ancona Guide and tagged Alisa Nemirovska, Ancona, Ancona Cathedral, Archaeology, architecture, arts, Backpacker, Calamo’s Fountain, Cattedrale di Ancona, City Guide, Cricket’s Aunty, Fontana del Calamo, google maps, History, Italy, Lazzaretto, Marche, Mole Vanvitelliana, Museo Archeologico Nazionale delle Marche, Museum, Museum Tattile Statale Omero Ancona, National Archaeological Museum of the Marche Region, Omero Tactile Museum of Ancona, Sample Itinerary, Santa Maria della Piazza, Self Guided Walking Tour, Solo, Teatro delle Muse, Theatre of the Muse, Travel, Travel Blogger, Walking Tour on February 17, 2013 by Cricket's Aunty.